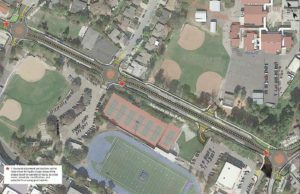 W-Trans completed a complete street corridor evaluation of Alameda de las Pulgas between Ralston Avenue and Club Drive-Dartmouth Avenue at the border of the Cities of San Carlos and Belmont in the vicinity of Carlmont High School and Tierra Linda Middle School. The focus of the study included pedestrian, bicycle and vehicular circulation issues combined with safe routes to school for all modes. The project included data collection, review and analysis, alternatives/options development, school walking audits, and public outreach. Coordination with the “Four Corners” working group (City of San Carlos, City of Belmont, Sequoia Union High School District and the San Carlos Elementary School District) was maintained through the process. Alternatives were developed that include options for traffic (bicycle and vehicular) circulation, pedestrian circulation, and parking within the public right-of-way and on both school campuses. Also considered were alternative school entrances/exits, traffic control measures for the corridor and side streets and alternatives for improving transit through the corridor. The final preferred plan included a series of three mini-roundabouts which replaced two all-way stop controlled intersections and an intersection at the Cities’ border with non-standard geometrics.